April’s Art Jewelry Elements (AJE) giveaway was hosted by the multi-talented Lesley Watt of Thea Elements. Members of the AJE team, plus a few lucky guest artists, were given one of these delightful, ceramic button clasps that Lesley made for us. Here’s the bracelet I made with the clasp that I received. I combined Lesley’s clasp with an enameled bead in a matching color, a yellow-peach colored ceramic cube from Suburban Girl and a faceted polymer clay bead from Second Surf. 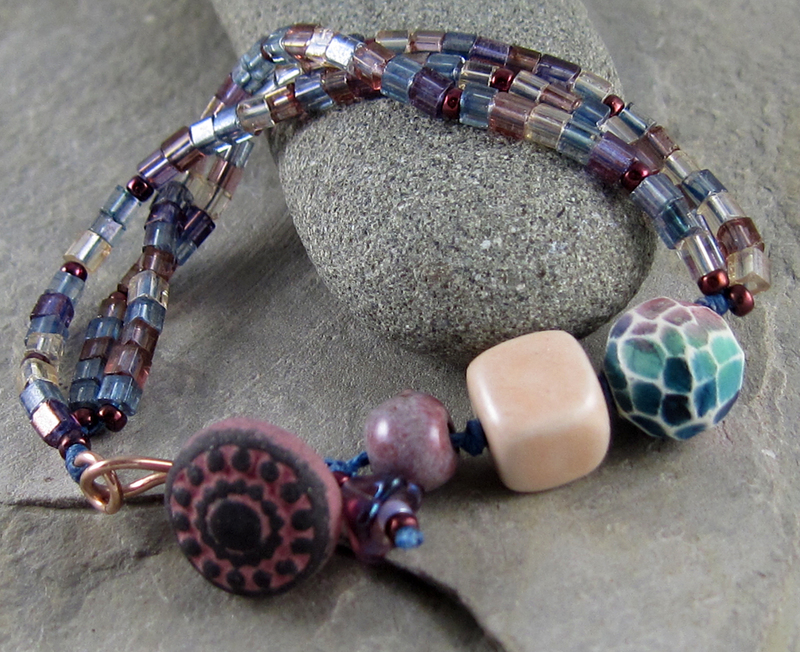 The back of the bracelet has 3 strands of glass cube beads, interspersed with purple Czech glass seed beads. I strung them all on denim blue Irish waxed linen and added a Czech glass flower dangle near the clasp. I called this the “Happy Day Bracelet” because I had the most delightful day when I made this bracelet. I began the day with my first session of a volunteer job tutoring a young man in basic reading skills. Our first session went much better than expected. I felt that old thrill that I always experienced as a teacher, when I could see that real learning was taking place. There’s nothing like it! After the tutoring session, I came home and made this bracelet. Then after dinner, I went to Marion Pollman’s studio for a ceramics lesson. We glazed my first batch of ceramic pendants and charms. I can’t even begin to express how happy I am that Marion is helping me to make my ceramic dreams come true! After all that goodness in one day, I was just certain that this had to be called the “Happy Day Bracelet“! Want to see more gorgeous jewelry with Lesley’s awesome button clasps? Here are all the links. Have fun! This entry was posted in Bead And Jewelry Challenges and tagged Art Beads, Art Jewelry Elements, artisan jewelry, bead blog, blog hop, bracelet, ceramic, fashion, Fine Art Ceramics, handmade jewelry, Lasley Watt, Linda Landig Jewelry, Marion Pollman, Second Surf, Suburban Girl Studio, Thea Elements by Linda Landig. Bookmark the permalink. Beautiful bracelet Linda – I love the soft heathery colours and the button sits so well with Barbara’s lovely faceted bead…this would be a well worn bracelet in my collection Thank you for taking part.. I love how all of the colours accent the button, but it’s still the star of the show! It’s a beautiful design! Linda, I always love seeing what you create, your sense of color is awesome. Love the story even more. As a homeschool mom and avid reader, I am so thrilled that my kids have the same love of reading. Thank you for making a difference in that young man’s life. And I’m excitedly following your journey in the clay world! I would love to venture there someday. I love it!!! Such a soft and pretty color palette! Happy day indeed! I love these colors and especially love that this helps you remember such a momentous day. Beautiful job! 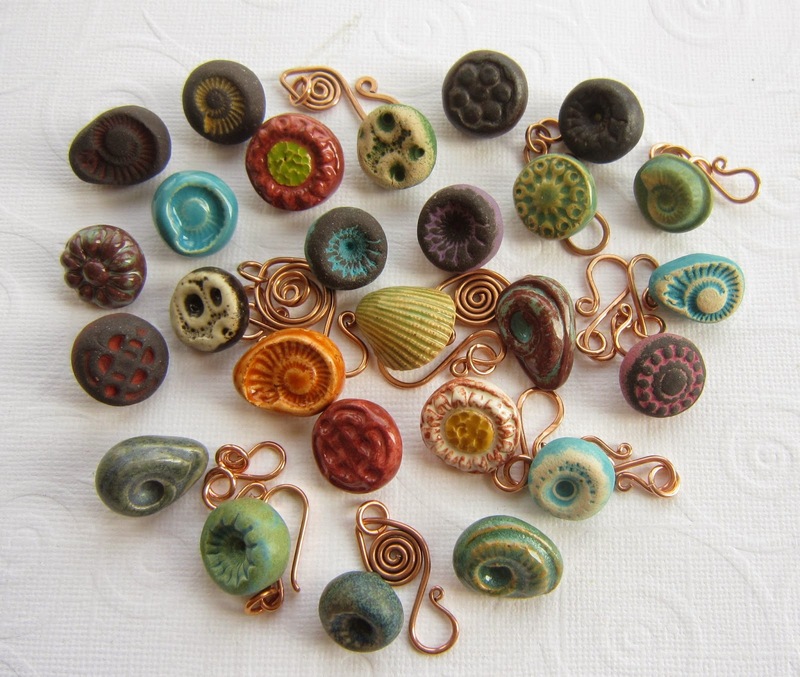 Beautiful selection of beads! I love the translucent glass seed beads with the button, and the little punch of turquoise in the polymer bead is a great addition! I love all shades of purple so I love your color selection. The shapes of the beads make this interesting visually. Well done! A Fabulouse Bracelet Linda! I love purple and you used so many different shades along with sizes, shapes and texture and they all go together so well. Love it! I loved the bracelet before I read the story about the name. Now I love it more! The strands of cube beads is so fun! Great bracelet! Awwww I love that you used some of my beads. I really like the soft color palette you chose overall. Also, I’m super excited to see your new adventures in ceramics! Linda your design puts all of the components together really well. You made the perfect parings. Great job. It is wonderful to hear that you had a happy day. Wow! I just LOVE this! I love the palette, the textures, how it all works together. 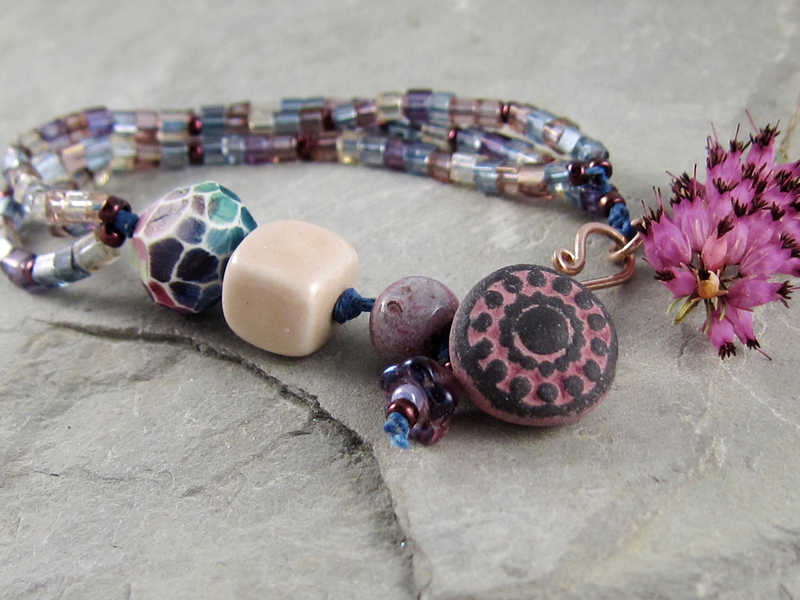 Linda, what a great combination of color and textures…I love that button and the design. Yummy! It is a lovely bracelet. 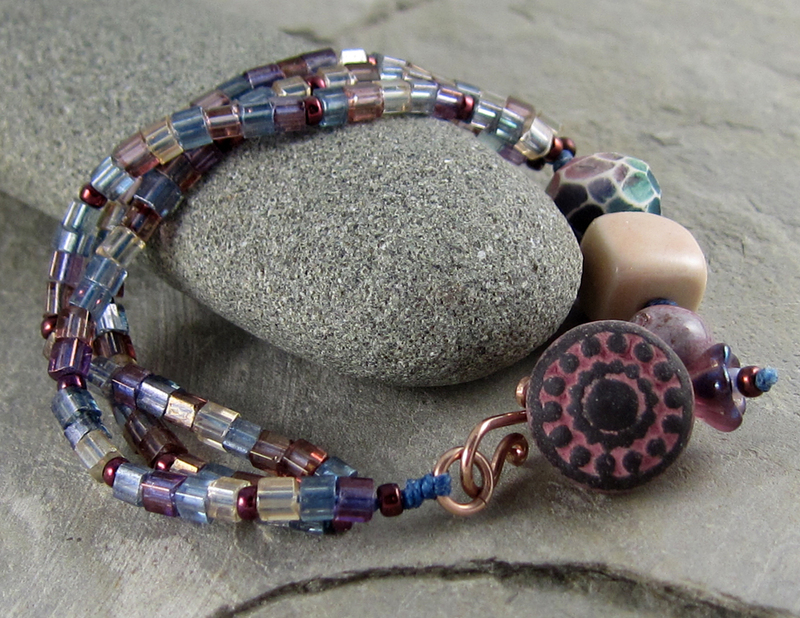 I love your use of the second surf bead with the clasp, they seem to go together perfectly. And, the simple cube beads that make up the majority of the bracelet don’t overwhelm your art beads and really let those shine. Excellent. Bracelets really are your “thing” Linda. You always do such a great job with them! This is beautiful as always. I love your bracelet Linda, you can really tell it was a great day!